Pedal Osteitis literally means inflammation of the pedal bone. There are two types of Pedal Osteitis: Septic and Non-septic. The septic kind involves infection within the foot that gets into the bone and is extremely serious. One indication that your horse might have septic pedal osteitis would be unresolvable abscessing, either low level chronic abscesses that just grumble on and on, or repetitive acute abscesses in the same foot within a short time period. When these happen, involve your vet to get a diagnosis and treatment plan. The non-septic variety is a term applied mainly to a radiographic finding where the fine blood vessels of the pedal bone appear enlarged leaving a larger channel through the bone and uneven margin to P3 which are picked up on x-ray. Horses with thin soles can often (radiographically) appear to have (non-septic) pedal osteitis and there is suspicion that it is closely linked with laminitis or at least inflammation of the solar corium. The inflammation causes the blood vessels to expand and these damage the bone around them. Not much is really known about pedal osteitis, even to the extent that no one really knows whether hoof lameness is caused by the less dense pedal bone (the inflammation in the corium that then leads to the lower density will definitely cause tenderness) or at what point on a sliding scale of reduced density the pain sets in. We also don’t really know whether horses can recover fully from Pedal Osteitis. 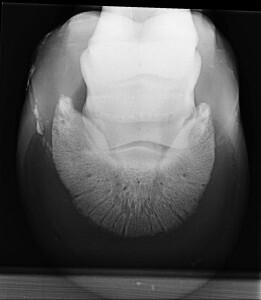 Given that bone is constantly remodelling, in theory, given ideal conditions, it should be possible, once the inflammation is reduced, to recover the pedal bone to its former density, but there is very little radiographic evidence of this because owners rarely have follow up radiographs taken once a horse becomes sound again. For some really geeky information regarding Pedal Osteitis, please see this article on the International Veterinary Information Service website: Non-septic Pedal Osteitis: A cause of lameness and diagnosis? There is also a really interesting discussion on pedal bone density from Dr Robert Bowker on Epona.tv – you will need to pay for access, but it is really worth it, there are loads of really interesting videos to watch on the website as well as several very good videos from Dr Bowker.